The Bubble comes down for the Summer, but you can join as an Adult full member at £260, which is the best price if you intend to play all year round using the Bubble. Join as a Winter Bubble Member, Oct 1st to April 30th(7 months) at reasonable rates,click on the Membership page to see all our membership packages. 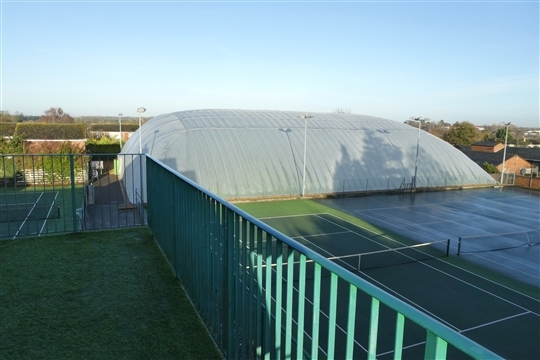 Our Bubble, which is floodlit, allows us to play tennis whatever the weather, on three indoor courts. There are a further 4 outside courts, 2 of which are floodlit that can be used as well. Adult Members,Bubble, Juniors (12 to 18) and Students can book up to 10 days in advance. If a Bubble member plays with an outside member or non member, then they are responsible for collecting the fees. Juniors (under 12) cannot book in advance. Outside Only Members can book up to 7 days in advance. Outside members booking a Bubble court must pay the appropriate fee on line at the time of booking and if playing with a Bubble member must also ensure that they play the appropriate fee! Non-members ( Pay and Play ) can book up to 7 days in advance and payment will be made on line at the time of booking. Non members who turn up without booking a court must pay the fee and place it in the envelopes provided at the club before playing.However it is advisable to book on line as you may find that your court has been booked by someone else! Members are welcome to bring Visitors but must sign them in and pay the appropriate fee before playing. Cancellation must be made at least 24 hours in advance, or you will be charged. Maximum booking slots are for 1.5 hours, and booking 2 slots in a day is permissable but not consectively! Booking of more than one court at any one time must be referred to the Booking Secretary. Courts can only be booked for a maximum of 1hour 30 minutes, if you require longer than that please contact the Booking Secretary. The Bubble is normally put up and dismantled on a Saturday, as close as possible to October 1st and April 30th (this is weather dependent - you'll be informed by email). Covair, the company who supplied the Bubble, do the majority of the work, but need volunteers to assist in the process - and this significantly reduces the costs to the club. We are very grateful to the volunteers for their time and effort and the club offers free homemade bacon sandwiches and cakes to all helpers!! Contact chairman@newmarkettennisclub.co.uk if you can spare some time to help!